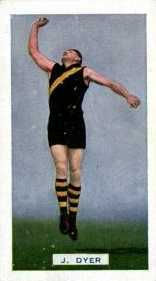 In 1935 Richmond Football Club were renegotiating their agreement with the Richmond Cricket Club for use of the Punt Road Oval. As an alternative to Punt Road Oval, Olympic Park was modern, next door to Punt Road Oval and was not affected by the cricket season. Management at Olympic Park were also offering a larger percentage of the gate.than Richmond received at Punt Road. 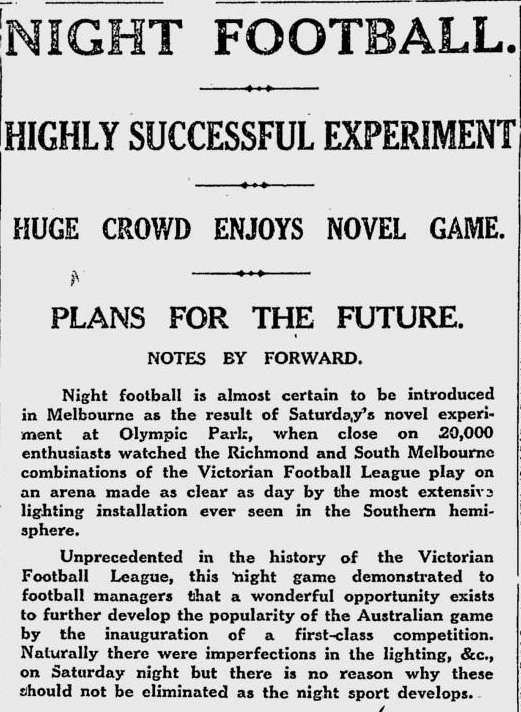 (The Age 30Mar1930 p24) In this climate and before the start of the VFL season, Richmond organised a night time game at Olympic Park. This would be the first Australian Rules game involving a major teams under artificial light since 1879. As such the match was highly reported in the Australian Rules States and it’s success would be noted and remembered. Richmond and South Melbourne had both been Grand Finalists in 1934, so even without the novelty value, a big crowd would be expected. It must be remembered that the lights had been used since 1925 and there had been at least once instance where soccer had been played on the ground at night. (Argus 9Oct1934 p8) This would be a new for the football community, but the lights had been in use at the ground for a long time and their quality and reliability were well known. 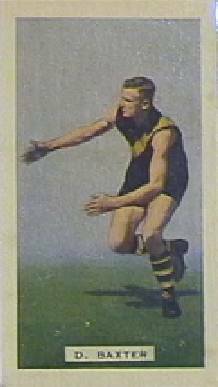 The VFL gave permission for the match and Richmond would play on 30 March with a white ball especially prepared by Syd Sherrin (Argus 22-Mar-1935 p14). Players marked with * are mentioned in the Argus or Age Newspaper Match reports. 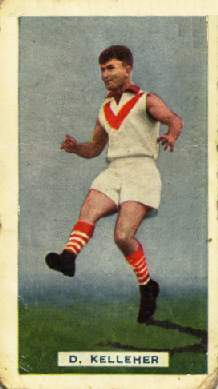 Joe Garbutt, the Port Melbourne Player, trained with South Melbourne in the 1935 pre season but eventually played the 1935 season with St Kilda. 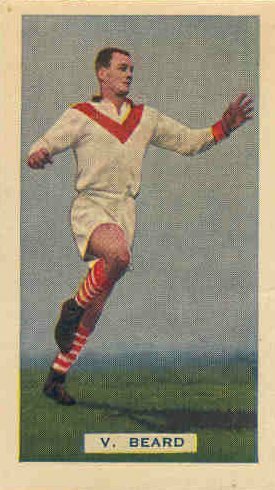 The Age newspaper report on the Monday after the game listed that South Melbourne were missing a number of key players including Bill Faul, Jack Bissett, Austin Robertson, Laurie Nash and Bob Pratt. Pratt and Bissett were listed on the Friday night list and therefore although listed, they did not play. 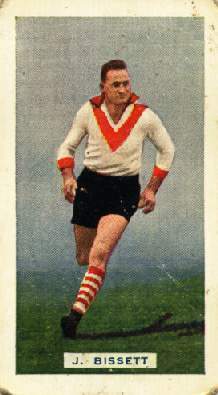 Syd Dineen a centreman for Preston played on the night for South Melbourne. For the winners none was more conspicuous than Basil McCormack – (Argus 1-Apr-1935 p7). 25,000 people crowded Olympic Park to watch Richmond and South Melbourne. 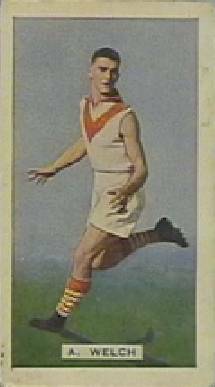 When they last met in the 1934 Grand Final, Bob Pratt had kicked his 150th goal for the season, but South Melbourne lost by 39 points. The night was a booming success for Richmond and the club profited by 200 pounds. On the night a match for the next week was announced over the loud speakers to cheers from the crowd.